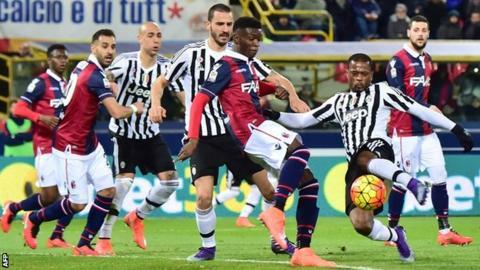 Juventus' run of 15 consecutive Serie A wins came to an end as they were held to a goalless draw at Bologna. Bologna, coached by AC Milan legend Roberto Donadoni, had the only shot on target, while Juve's Paul Pogba wasted two good chances after the break. Juve boss Massimiliano Allegri rested leading scorer Paulo Dybala, introducing him after 68 minutes. Juventus are now two points ahead of second-placed Napoli, who entertain AC Milan on Monday. Match ends, Bologna 0, Juventus 0. Second Half ends, Bologna 0, Juventus 0. Antonio Mirante (Bologna) wins a free kick in the defensive half. Offside, Juventus. Leonardo Bonucci tries a through ball, but Juan Cuadrado is caught offside. Foul by Anthony Mounier (Bologna). Offside, Juventus. Paul Pogba tries a through ball, but Leonardo Bonucci is caught offside. Corner, Juventus. Conceded by Antonio Mirante. Attempt missed. Álvaro Morata (Juventus) right footed shot from the right side of the box is close, but misses to the right. Assisted by Stephan Lichtsteiner. Attempt missed. Emanuele Giaccherini (Bologna) right footed shot from the right side of the box is high and wide to the right. Assisted by Franco Brienza. Attempt missed. Paul Pogba (Juventus) left footed shot from the left side of the box misses to the left. Assisted by Claudio Marchisio. Substitution, Bologna. Franco Brienza replaces Saphir Taïder. Offside, Juventus. Juan Cuadrado tries a through ball, but Paul Pogba is caught offside. Corner, Bologna. Conceded by Stephan Lichtsteiner. Offside, Juventus. Paulo Dybala tries a through ball, but Paul Pogba is caught offside. Attempt missed. Mattia Destro (Bologna) right footed shot from outside the box is too high from a direct free kick. Mattia Destro (Bologna) wins a free kick in the attacking half. Substitution, Bologna. Kevin Constant replaces Adam Masina. Attempt blocked. Paul Pogba (Juventus) right footed shot from outside the box is blocked. Assisted by Paulo Dybala. Substitution, Juventus. Paulo Dybala replaces Simone Zaza. Substitution, Bologna. Anthony Mounier replaces Luca Rizzo. Foul by Adam Masina (Bologna).